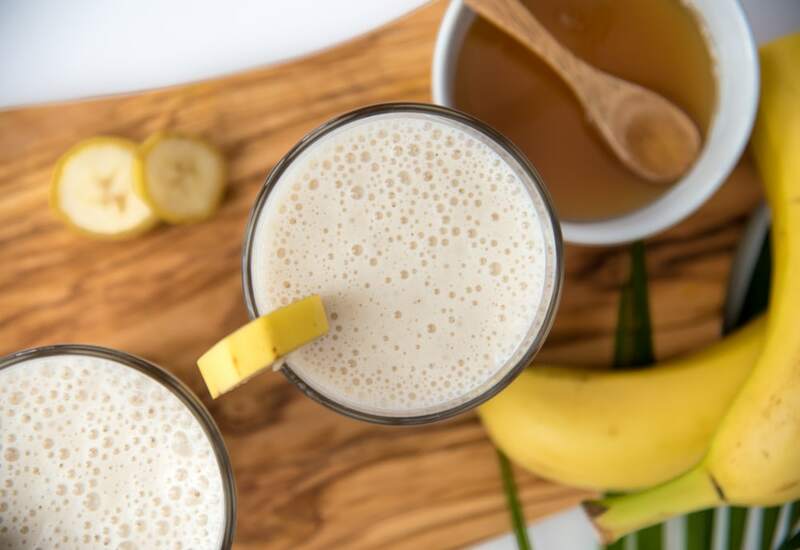 This recipe for banana smoothie is packed with protein, tastes great, and couldn't be any simpler. Almond milk gives it great flavor while the frozen banana gives it a rich, creaminess that also keeps the drink icy cold. This recipe is so quick to make, even when you're rushed in the morning, you'll have time to blend up the smoothie. It's also fantastic after a workout or just to sip when you're craving something cold, creamy, and sweet. If you see bananas on sale at the market, buy a bunch (ha ha), then peel and freeze them for later use. Want to make this smoothie even more nutritious? Try adding chia seeds, which are a superfood. They have good-for-you omega-3 fatty acids, protein, fiber, antioxidants, and calcium. Plus, they add delightful little pops to your drink. Per Serving: 412 calories; 4g fat; 70.8g carbohydrates; 28g protein; 5mg cholesterol; 63mg sodium. Very simple banana smoothie recipe. Sometimes I like to mix in chocolate or almonds. Perfect after a workout on a warm day. This was a quick and easy banana smoothie recipe that reminded me of a banana shake. It's also really good when you add a scoop of banana.